‘Resurfacing Taddle Creek’ — by Toronto-based landscape architecture firm North Design Office — is the first outdoor installation commissioned by the Toronto Design Offsite Festival. 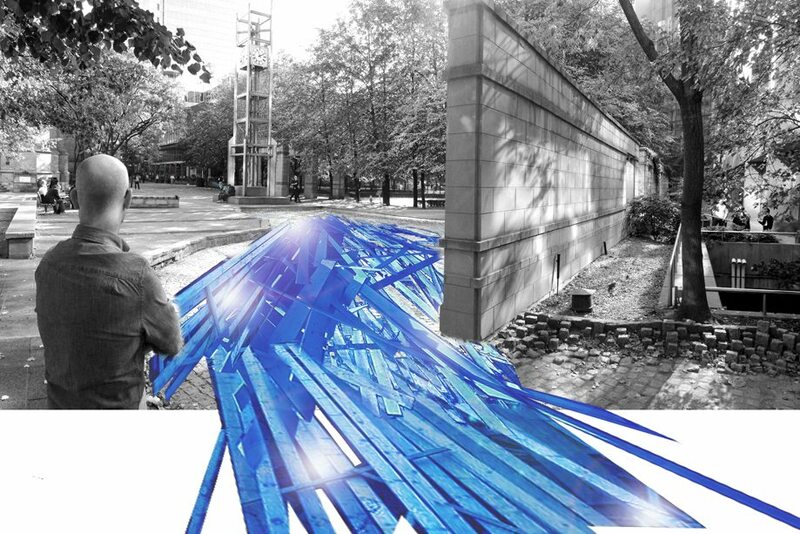 North Design Office resurfaces the rich history of Toronto’s Taddle Creek by animating a portion of its path that lies beneath Toronto’s city streets. In bringing Trinity Square Park’s water feature to life through new sculptural forms, North Design Office fashions structures of brightly painted tree fragments, and intertwined lighting to create a flow through this urban space. ‘Resurfacing Taddle Creek’ is a nod to historical landscapes, which often get erased as we adapt urban environments to accommodate growing populations. The exhibition signals Taddle Creek’s path while also bringing light and cheer to deep winter nights. Special thanks to the Downtown Yonge BIA.